As a former protestant Christian, it seems that Mary was only really brought up around Christmas time during the Christmas narrative. Even then, there was not much emphasis at all placed on Mary, but I think most protestants do not get the true Catholic view of Mary. That would also include some current and former Catholics. However, thanks to a Catholic men's group that I'm in, I am beginning to understand Mary more than ever before. Let's set the record straight before I dive in: 1) Catholics do not worship Mary and any that do are wrong. 2) Catholics do not believe that Mary is equal to the Trinity and any that do are wrong. I never had an issue with Mary during my Catholic journey. Whether she is mentioned a lot in the New Testament or not is not important to me. She is mentioned enough for me to know that she said YES to God, Mary gave birth to my ( our ) Lord and Savior Jesus Christ, Mary was at the foot of the Cross and Mary was in the upper room with the Apostle's. Whether she was mentioned over and over and over is not important. Mary played a key role in the life of Christ: She was his earthly mother from conception through his death at age 33. Protestant Christians are often quick to dismiss Mary and even use scripture to make it look like Christ didn't really see that Mary was all that special which is ludicrous. But the reality of the Catholic role of Mary is to POINT US TO CHRIST. In other words, getting closer to Christ through Mary. Oh and just stop that "I can go straight to Jesus and love him." Although that's true, imagine trying to emulate the love of a mother for her child. That's what going to Christ through Mary is about at the core. It's about having a deeper love for Jesus. A love like you have never had before. I purposely used the two images above because we know Mary held Jesus as a child and we know Mary was at the foot of the cross. It only makes sense that Mary would hold her son when he was taken down from the cross. Imagine any loving mother holding her child who had not only just died but died a gruesome, humiliating death. It doesn't matter whether you are Protestant or Catholic. I want you to stop for a minute and think about something: The LOVE a good mother has for her child ( children ). I'm a father of two adult daughters and I love my daughters. There is nothing like holding your own new born for the first time. However, my wife has a love for our two girls that is different. After nearly 29 years of marriage, I know there is something different about a mother's love for a child compared to a father's love for a child. Part of my wife's love comes from carrying our daughters for 9 months each. There is a special bond between a mother and a child. No matter how old a child gets, your child is still your child. Your child is also supposed to outlive you, so let's look at Mary and Jesus. As I begin to think beyond scripture and think of the love a mother has for her child, there are a lot of logical, human nature things that come to mind that begin to make me want to love Christ as Mary loved Christ. But I don't think that even the best Christian can ever love Jesus more than His mother. If you are a mother, will anyone ever love your child ( children ) more than you? If you are not a mother, think of the deepest love you have for any human being and try to imagine anyone loving that human being more than you. We may never truly love Jesus as much as Mary, but the goal is to emulate Mary's love for Jesus as much as possible. Trust me, I know that I love Christ. His love has brought me to tears countless times. However, now as a Catholic, I want to embrace everything Catholic and anything that can help me love Jesus even more. I'm learning many things that I missed out on as a protestant and I wished my non-Catholic family and friends could truly see what they are missing out on. I believe may Christians let self get in the way especially Protestant Christians who think they have it figured out and that being Catholic is not for them. Mary said YES to God. Mary gave birth to Christ. Mary, with Joseph, presented Christ in the Temple. Mary was there during Christ childhood. Mary was there during Christ first miracle at the wedding in Cana. Mary was at the foot of the cross. Mary was in the upper room with the apostle's when the Church was getting started. We know that Jesus did more than is in the Bible. John 21:25 "But there are also many other things which Jesus did; were every one of them to be written, I suppose that the world itself could not contain the books that would be written." It is only logical that during the 33 years Jesus lived that Mary did more in her life than is in the Bible. This past week as I was praying the sorrowful mysteries ( listed below ) of the Rosary, I began to think about Mary. I cannot imagine the pain Mary must have felt seeing her son go through such a humiliating death. But I also believe that her motherly loved shined during this difficult time. Side Note: It is "not" required that Catholic's pray the Rosary, but WOW, what a powerful prayer tool. There is no mention of Mary being in the garden, but as his mother, she likely knew that Jesus was troubled. As a faithful woman who loved God, I believe that she would have been praying to God for Christ during this time. As Christ mother, she would have been concerned about her son. For the 2nd through 4th above, although we know Mary was at the foot of the cross, there is no New Testament verses that state whether Mary was present at the 3 events above. Since this was a very public event to further humiliate Jesus, I believe that Mary was most likely present. Imagine the pain a mother would feel for her son. Anyone who loved Jesus that saw him beaten, crowned with thorns and then carrying the cross knowing that he was about to be crucified would have been in tears and crying out to God. Mary loved Jesus like no other earthly person could. Imagine how she must have felt. In John 19:25, we know that Mary was at the foot of the cross. I cannot imagine seeing my child hanging on a cross knowing that death was emanate. It's only logical that Mary would hold Jesus in her arms once he was taken down from the cross. It disturbs me how many professing Christians downplay Mary's role. Mary was the Mother of Christ. No other person ever had that kind of role in the life of Christ. Imagine Mary's love for Christ and her sorrow during his crucifixion. Imagine what Mary must have felt holding Christ in her arms after his death. I firmly believe that Mary was a loving, caring and there every minute, for Jesus, mother all 33 years of Christ earthly life. But Mary lived longer on this earth than Jesus and her love continued after his death. Now that Mary is in heaven with Christ, Mary's love continues for eternity. I want my love for Christ to emulate Mary's love and continue for eternity. 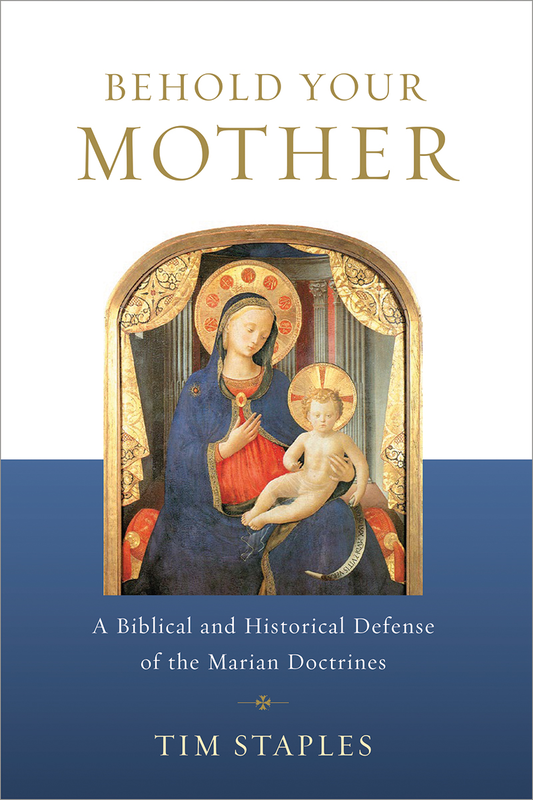 If you want to go far deeper into a study of Mary, Check out Tim's book: "Behold Your Mother: A Biblical and Historical Defense of the Marian Doctrines"